Back in 2013, as a New Year’s resolution, I decided to send a note of encouragement to someone every week. The idea was to hopefully brighten their day and to also instill a little more gratitude in my life. I kept things old school…with pen to paper and with a stamp through the mail. It was so much fun that I kept it up. So, every Wednesday I sit at my desk and draft a letter. Some weeks, the letter conveys my thanks. Other weeks, it expresses my sympathy. Some weeks, the letter is a prayer. Other weeks, it is words of encouragement in the midst of a battle. Some weeks, the letter contains my congratulations on a job well done. Other weeks, it is meant simply to brighten a day. Some weeks, I send more than one letter. Other weeks, I struggle with writer’s block. To avoid the latter, I started to keep a list of people that are noteworthy. This Wednesday, I sat down to write a note to the next person on my list. Tears welled in my eyes as I realized it was too late. How can it be too late to send a note of encouragement? Well, it just so happened that on Tuesday, I attended her funeral. She didn’t know how I felt about her. She didn’t get to smile when she opened something in the mail that wasn’t a bill. She didn’t know she had touched my life in an extraordinary way simply by being who she was. 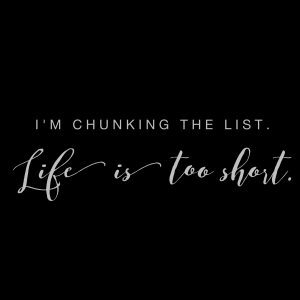 So, I’m chunking the list. Life is too short. Posted on September 7, 2014 by Nikol. This entry was posted in Reflections, Struggles. Bookmark the permalink. I feel so fortunate to have been a recipient of one of your notes of encouragement and it made all the difference in the world! LeRoy – I’m so glad you befriended me as well! I’m a lucky girl. Well said and soo true! !